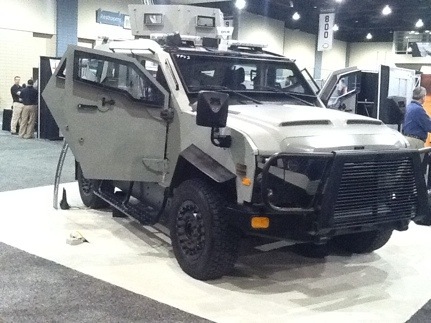 This is the Tactical Protector Vehicle from Oshkosh Defense. Built on a Ford F550 chassis, it is designed to haul up to 8 officers around and protect them from threats rated up to NIJ Lvl IV. This entry was posted on Monday, September 19th, 2011 at 12:43	and is filed under Vehicles. You can follow any responses to this entry through the RSS 2.0 feed. Both comments and pings are currently closed. It’s the Israeli SANDCAT, the Tactical version not too far removed from the Military version. The Mexican Federal authorities have a bunch in service. Pretty nice vehicle with reasonable armor…………..